Digital Hand-held "Pocket" Cutting Oil Meter PAL-102S is designed for controlling the concentration of cutting oils. This is most suitable for the measurement of the percent dilution and controlling the percent concentration of hydraulic oil and cleaning liquid. Cutting oil, molding lubricant and rust resistance liquid are also well within the measurement range of the PAL-102S. With a water resistant design, the PAL-102S can also float in water which will help to prevent unforeseen accidents. 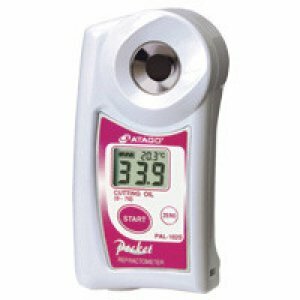 Quick and easy measurements can be taken with the PAL-102S anywhere on your factory floor.